The kids had a blast picking out their own chicks and we ended up with 6 chicks, 5 breeds: Dark Brahma, Black Australorp, Buff Orpington, Gold Laced Wyandotte, and Americuana. Very fancy. Melinda, the owner of SeaBreeze Hens, cheerfully (and patiently) cashed out each child as they bought their chicks with their hard-earned chore money, and packed the girls up for the trip. Apparently everyone calls their chickens “girls.” Melinda has really welcomed my kids with open arms both times we’ve been there, gaining 7 new loyal customers in the process – I’m sure she’s delighted. And since I’m sure somebody’s chicken is going to be eaten by one of the million hawks in our backyard, we’ll be back soon, Melinda! The chicks have now been with us for two weeks, and so far it’s been relatively simple as far as babies go. 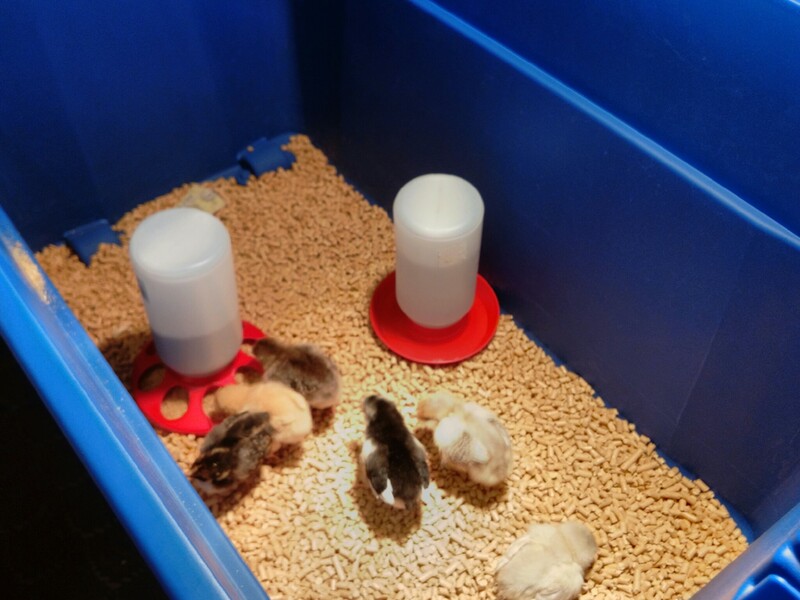 We have a giant tupperware in the guest room fitted with a heat lamp, feeder and waterer, and filled with pine wood shavings. I change the water and food 2-3 times a day (they’re pretty sloppy) and the bedding once a week, though I make poop scooping a priority daily. Can’t be too good of a hostess when your guests smell like chickens in a 90-degree room. The kids visit their new pets twice a day, under strict supervision since my 2 year old is as dangerous to chicks as any hawk. 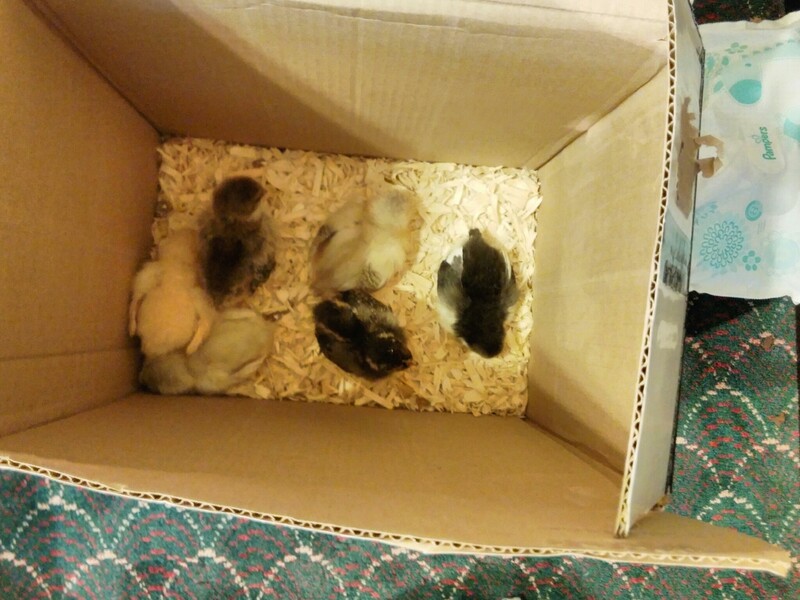 The ladies have been named Peep, Fluffy, Loudy, Runny (as in run away), Fred and Hank. Fred, the Gold-Laced Wyandotte pictured on my shoulder, is the most calm, cuddly little thing, and lets the kids handle her constantly. Our Americuanas, Peep and Runny, are not quite so keen on being touched and spend a lot of time running away from us and at the other chicks (they’re bullies, too). Hank, the Dark Brahma, is very curious and loves to chase mealworm bits as he sends them flying around the room. Yum. Ryan put the coop together, half because he is kind and handy, and I think partly in anticipation of chicks not pooping on his carpet. We had some trouble with shipping delays and communication, but the wood and coop plan we got from Ranch Coop in Texas were quality and we’re pretty pleased with it overall. It’s light enough that we’re planning to move it every day or two so that the chickens can fertilize our lawn, be exposed to fresh grass for foraging, and cut out our need to use and change bedding. Chicken experts, please feel free to correct me if I’m wrong here! 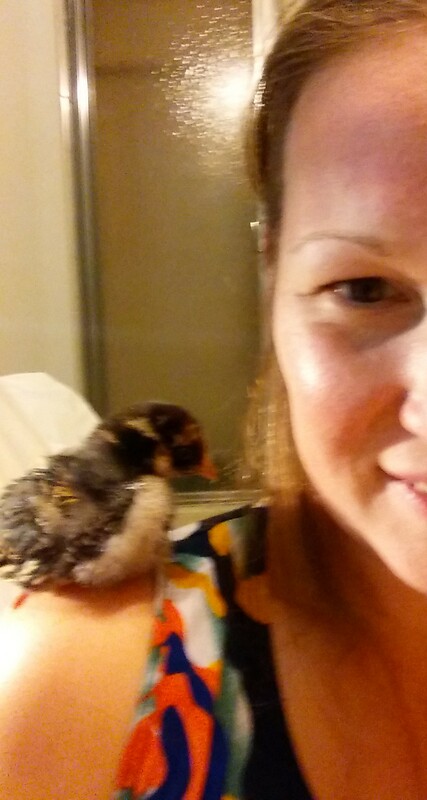 So for now, chickens are still proving to be the right pets for our family. Cute, social enough, but totally not high maintenance which works well for a family of 7. The only thing nagging in the back of my mind is the predator situation once we move them outside in a couple of weeks. Our yard has suddenly become a favorite hawk hangout, and I’m pretty sure that they, too, want chicken nuggets.